Liverpool defender Andrew Robertson has laughed off suggestions manager Jurgen Klopp is feeling the pressure of the Premier League title race. 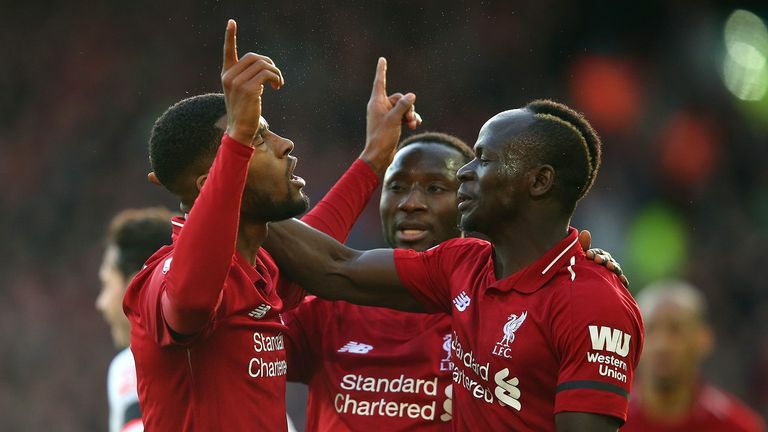 Consecutive 1-1 draws against Leicester and West Ham allowed Manchester City to briefly replace Liverpool as Premier League leaders, although the Reds returned to top spot with a 3-0 win over Bournemouth on Saturday. Klopp was involved in a heated discussion with Hammers boss Manuel Pellegrini after the draw at the London Stadium and the FA sought written observations from the Liverpool manager for his comments made about referee Kevin Friend. However, Robertson insists Klopp is not struggling with the pressure of the title race and says the former Borussia Dortmund boss has been a calming influence at Anfield. "He has been calm and the backroom staff have been a different class," said Robertson. "They are the team behind the team and they are the ones who keep us going and positive. "In terms of the players we've not seen any difference in any of the staff and that feeds into the players and we've not changed; whether we draw, win or lose it doesn't change. "It's a relaxed training ground and it is all about winning games. The only thing we get annoyed about - not nervous about - is that we want to win every game. "If we have a bad result we use that to put in a positive performance the next game and that's what we've done. "Since Monday (at West Ham) we've studied this (Bournemouth) game. We wanted to have a clean sheet and we wanted to get some goals back in and it could have been a lot more (than 3-0)." Liverpool will now head to a warm-weather training camp in Marbella in preparation for their next match against Bayern Munich on January 19, and Robertson believes the win over Bournemouth has helped to calm fans' nerves on Merseyside. "I don't think it's a message to any other team or anything," said Robertson. "But it's maybe a message to our fans and everyone connected to the club that we're here.